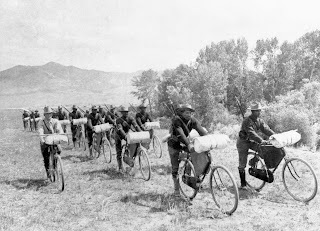 25th Bicycle Corps: Lt. Moss and the men on their "wheels"
Lt. Moss and the men on their "wheels"
In 1897, 20 soldiers, an army surgeon and a reporter led by Lt. James A. Moss, rode bicycles from Fort Missoula in Montana to St. Louis, Missouri. The trip was made as an experiment to see whether the bicycle could serve a useful purpose in the Army. 1890s America was also experiencing a bicycle-craze due to the recent invention of the "safety bicycle" (a bicycle with wheels of equal size and chain driven). Accounts make it clear that Moss had a romantic streak, and enjoyed the outdoors, as well as what he referred to as "the poetry of cycling". The 41-day journey to St. Louis was 1,900 miles and took the men through Montana, Wyoming, South Dakota, Nebraska and Missouri. In the 1890s, the Army was segregated, with most black units (a.k.a "Buffalo Soldiers") serving in the isolated outposts in the West. Fort Missoula, at that time, was home to the 25th Infantry, a black regiment. Moss was a Southerner and recent graduate of West Point. He was only twenty-five years old. He and some of the '97 riders had done trips before. 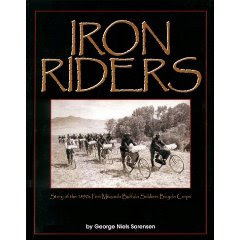 In the summer of 1896, eight of them rode first to the Mission Mountains, north of Missoula and then Yellowstone Park. For the St. Louis trip, Moss picked a path that mostly followed the railroads -- the Northern Pacific to Billings and then various arms of the Burlington the rest of the way. Fortunately, Eddie Boos, a nineteen-year-old, rode along with the Corps to St. Louis and wired lengthy reports to the local Missoula paper, as well as newspapers all over the United States. Combining his accounts with those of Lt. Moss, we get a fairly detailed picture of the trip. Sadly, no accounts from the soldiers, themselves, are known to exist. We only know them through Boos and Moss's somewhat stereotyped descriptions. Nevertheless, what comes through is a group of highly dedicated, tough, resilient, men who at the end of a long, hard ride still had a keen sense of humor and enjoyment of life*. A year after the trip they proved their mettle as soldiers, securing key victories during the Spanish-American War. Boos tells us that the Corps was escorted by hundreds as they drew closer to the finish of their journey and were welcomed by over 10,000 upon reaching their goal in Forest Park in St. Louis. On this blog you will find primary sources, including newspaper accounts, Lt. Moss's reports and links to 1890s maps. It is my hope that those familiar with this story will find this site a useful research tool. I invite you to help me add to the available body of information if you know of anything I've missed. For those new to the story, perhaps this site will spark further interest. 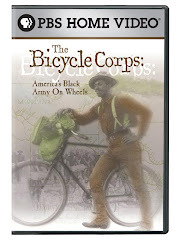 * "At the battle of San Juan, when numbers of the American bicycle corps were wounded, they would simply say, "I've got a puncture." For the rest of you: Jim wrote some very kind words about this site on his. It's great to share similar interests with people. It bears mentioning that Jim has a 24 year active duty record of service in the U.S. Army. I'll be recruiting him to help shed light on Army life. This is admirable. Thanks for the post! Your project is inspiring. I have an interest in WWII and recently finished a book about D-Day that showed Canadian soldiers exiting landing craft with bicycles, ready to hit the beach and ride. I wonder what happened to them, and have thought about trying to research. Your work makes me think it might be possible... Thanks for a rich and thoughtful resource. Mettle (I think) is spelled mettle, not METAL. Nice job, Mike. As an ex bicycle messenger and a current coach of a high school mtb team, I stand very much in awe of what these men did over a century ago. Three questions: What brand of safety bicycles did they ride? Did Lt. Moss, Dr. Kennedy and the report ride bikes also, and what are "cup brakes"? Inspired by this and Joss Summerfield's Pennyfarthing World Tours, I am looking to put together a military reenactor ensemble of the bike and kit. My profuse apologies for not responding to this sooner. I just discovered about five unanswered comments. Where did you see "cup brakes"? The reference I remember is "spoon brakes". It is possible, just barely, to see them if you blow-up the picture on the mainpage of this blog. They mashed down on top of the tire--which explains to me why there were so many "runaways" when the soldiers went down steep slopes. Nice blog, I wish I would have found it earlier. Do the "1997" dates on this blog exactly comport with the 1897 dates of the 25th Infantry's journey? Yes, the 1900 dates correspond with the 1800s. I haven't figure out a way to get blogger to let me post the real years.